Stand Up To Cancer’s Innovative Research Grant (IRG) recipients, early-career investigators who take fresh approaches to critical questions about cancer, continue to generate interesting and compelling research. One of these IRGs is David M. Weinstock, MD, of Dana-Farber Cancer Institute and Harvard Medical School, who was awarded a grant to help develop a rapid system for the identification of molecular abnormalities that drive cancer causation. Recently he was part of a team that studied a puzzling question: Why is cancer more prevalent in men than women? Glioblastoma, the most common type of brain cancer, occurs twice as often in men as in women, as does kidney and renal pelvis cancer and stomach cancer; liver cancer is even more likely to occur in men than women. Overall, men are 20 percent more likely than women to develop cancer, for reasons not fully understood. The team came up with a possible explanation: Women have more copies of certain genes that fight cancer. laboratory rats. 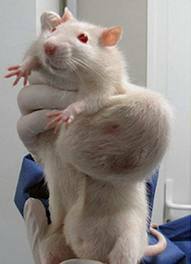 Pictures of the unfortunate rats with enormous tumors flashed around the world. The principal author, veteran anti-GMO campaigner Gilles-Eric Seralini, was hailed as a hero by the anti-GMO crowd. The flimsy structure of this particular exercise in rigged science has now come crashing down. The journal that published the study, Food and Chemical Toxicology, has retracted the article. The editors finally admitted what everyone else knew as soon as the study was published: it was bogus through and through. The editors could not bring themselves to state the case quite that plainly. Instead they said, “There is a legitimate cause for concern regarding both the number of animals in each study group and the particular strain selected.” The strain of rats, that is. Seralini was careful to select a type of rats that are known to develop mammary tumors at about two years of age (which is old for a lab rat). He fed the rats genetically modified corn and spiked their drinking water with glyphosate. Then he kept the experiment going until the rats developed the tumors you would expect anyway, and claimed that the tumors resulted from the corn and herbicide. Seralini’s published data did not even begin to support his conclusions. The German scientific academy, in an earlier review of the study, found his data presentation “incomprehensible.” He resisted requests for the raw data – although authors are supposed to provide it upon request. Apparently he eventually acceded to a request for the raw data, and the FCT editors delicately concluded that “no definitive conclusions could be drawn” from the data. The rigging was so transparent that many prominent scientists pointed it out immediately, and it is still a mystery why a relatively prestigious journal like FCT published the article to begin with. Scientists around the world erupted in condemnation of the article, and scientific academies across Europe denounced it. But it took the editors of FCT a year finally to own up to their mistake and retract the article. They did so in a news release. Hopefully the retraction will remind both scientists and scientific journals that peer review is supposed to occur before an article is published, not as the result of an all-out scientific war after publication. FCT could have saved itself a serious blow to its prestige by taking peer review a bit more seriously.